As professional teams seek to increase attendance and grow their revenues, they’re expanding and enhancing the fan experience with amenities inspired by a hospitality mindset. In professional sports, the competition to win fans’ loyalty off the field can be just as intense as the action that takes place on it. With an explosion of digital media and in-home, high-definition broadcasts clamoring for people’s attention, sports franchises are doing all they can to enrich the game-day experience with amenities inspired by the hospitality and entertainment industries. And where better to amp up the entertainment than in Los Angeles? There, a stadium for Major League Soccer’s latest expansion team, the Los Angeles Football Club, is breaking new ground by incorporating a mix of uses. Located in Exposition Park, the 22,000-seat stadium will serve as a year-round destination. Ancillary program elements include a conference center, meeting rooms, retail, a large food hall, a stand-alone restaurant—and possibly a world football museum. Owners want stadium clubs and lounges to be easily converted for events, parties, and receptions for business or pleasure. The stadium design will have a European style, with steep seating decks that extend close to the pitch, or playing field. An overhanging canopy will contain the crowd noise and provide shade. And a reserved section at one end zone will house the rowdy fan clubs—passionate supporters who have been included in design presentations and focus groups. In addition to the stadium bowl, the facility will feature lounges and clubs that are distinctly themed to reflect L.A.’s diversity—from the artsy, gritty East Side of town to the more refined tastes of Beverly Hills. “That’s been our springboard for the design,” says Gensler’s Elizabeth Pritchett. In addition to their use on game days, some of the clubs will double as revenue-generating special event spaces, while others will operate daily as restaurants and bars. The cornerstone of the complex is The Ford Center at The Star, an enclosed, 12,000-seat multipurpose events center and training facility. 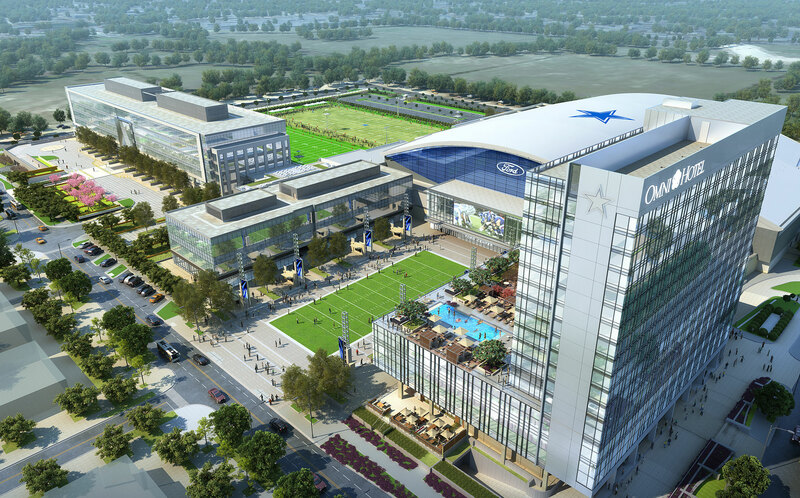 It will be joined with the Cowboys’ new headquarters and a 300-room Omni Hotel, all designed by Gensler. The project is the result of a partnership among the Cowboys, the City of Frisco, and the Frisco Independent School District. “Part of the agreement is that the Cowboys’ indoor practice facility will be used as the football venue for all eight of Frisco’s high schools,” Emmett says. The facility will host other community activities, as well as concerts, corporate events, and weddings. “It’s like an entertainment campus, as opposed to a stadium,” says Gensler’s Stacy Bisek. Even the cafeteria was designed to be a multi-use space. More than a place for staff to get meals, the cafeteria can also be staged as a prefunction or banquet space to complement events happening in the adjacent theater. The revitalization was staged over two years. Renovations in the first phase included a 40-by-192-foot HD video board that is nearly triple the size of the original one. Other improvements included ribbon-board displays, communal viewing decks, improved circulation, and an enhanced sound system. While overall seating capacity was reduced, about 1,000 new seats were added to the lower tier to provide premium seats closer to the action. Sports teams value their loyal fans. They’re always looking for new ways to deepen the relationship. Every touchpoint with their fans is an opportunity for engagement. Other recent stadium renovations have addressed similar demands from team owners, who are often competing with other local pro teams for audiences and corporate sponsorship dollars. At Lincoln Financial Field, where the Philadelphia Eagles play, Gensler added 1,600 seats; new HD video boards; refreshed club, suite, and marketplace spaces; and a new Touchdown Club. At Staples Center in Los Angeles—home to NBA, WNBA, and NHL teams—the firm renovated underused space with luxury banquettes and 1,000 square feet of programmable lighting. 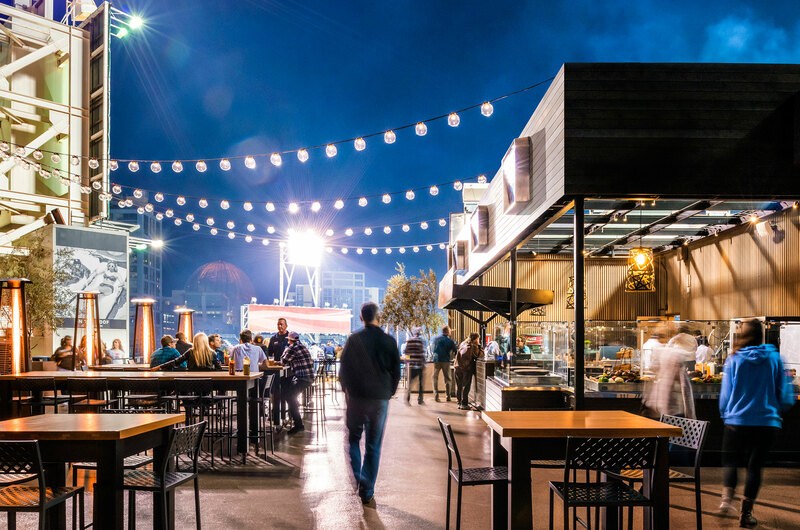 In San Diego, Gensler was brought in by Delaware North to overhaul the food and beverage concessions at Petco Park, home of Major League Baseball’s Padres. “Our goal was to capture the San Diego culture and vibe to make the ballpark a local destination,” says Gensler’s Kirstie Acevedo. Five major concessions were introduced, including a brewery, an organic market, and a barbecue joint. “We reinforced the concept of ‘home’ with communal tables and living room–type furniture,” she notes. Fans also gather in Park at the Park, a grassy area that encourages people to enjoy conversation and linger awhile. The concessions play off the idea of food-as-theater, where fans see their meat being carved or salsa being made—creating a more personal experience. In all these projects, brand plays an important role, not only for the team identities, but also as owners look to boost sponsorship revenues. 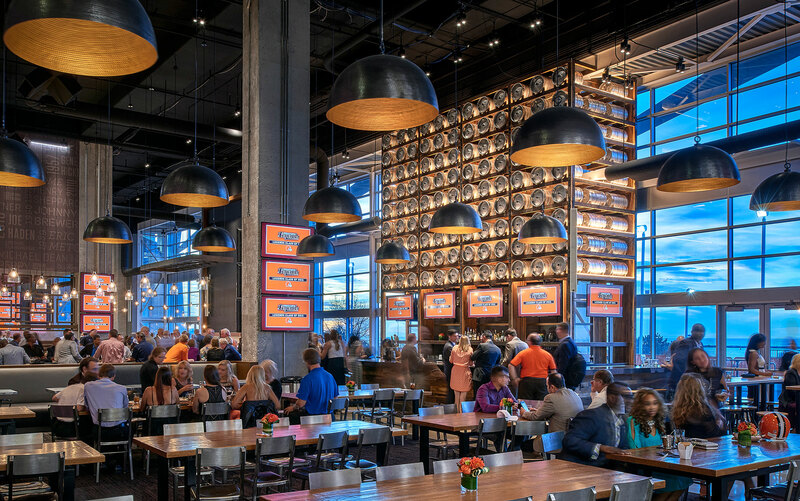 Currently in the works are nearly a dozen brand-focused retail spaces or sponsored viewing decks for Anheuser-Busch, mostly in sports venues. All are building on creative concepts first developed for Anheuser-Busch at Beer Park, a rooftop bar and grill on the Las Vegas Strip. “Here the ballpark concept was applied to a non-stadium venue,” says Gensler’s Derek Sola. “The components that make for an exhilarating sports experience are being reinvented in projects that aren’t even within a ballpark.” This is giving brands like Anheuser-Busch greater visibility by bringing the stadium experience to their customers. Vernon Mays is a senior editor at Gensler and a contributing editor at Architect magazine.